From April residents and small businesses in Jurong can choose their electricity retailer, as the soft launch of Singapore’s Open Electricity Market gets underway. This latest phase in the Energy Market Authority’s incremental programme to liberalise the electricity sector is a prelude to the launch of competition throughout the city-state in the second half of 2018. So, what can consumers expect from the competitive market? Domestic and small business customers in the open market aren’t be obliged to choose a new energy retailer and can simply stay with their current supplier, SP Services. But those wanting to switch can pick one of the fourteen companies who are participating in the soft launch. These are all already suppliers in the liberalised corporate power sector. The biggest six – Tuas Power, Senoko, Seraya, Keppel, SembCorp and PacificLight – have collectively carved out a two-thirds share of that market. Fixed unit rate for the contract term. Discount off the SP regulated tariff (which is updated quarterly). The initial discounts range from 5-22%, depending on the supplier and the length of the contract. Time-of-use (TOU), with differentiated peak / off-peak rates. The most common offers for the soft launch are fixed and discounted rates. Five companies have launched static TOU tariffs – iSwitch, Keppel, PacificLight, Red Dot Power and Tuas Power. Green tariffs. Sunseap offers a choice of 100% green energy at no extra cost (compared with the regulated rate) or 5% green energy and a 20% discount off the SP tariff. Sun Electric is offering 5% solar energy with 15% off SP’s rate. Meanwhile, Ohm Energy customers can choose a carbon-offset ‘add-on’ to their price plan, whereby they pay an extra per-kWh charge to go green. Flat monthly fee from Sembcorp Power, with capped usage. Customers pay the same amount every month irrespective of their usage up to a predetermined cap, with any excess consumption charged at a discount to the SP rate. Half-hourly wholesale market pricing from Ohm Energy. There is a monthly fee to be on the plan, and for an additional monthly fee customers can buy the security of capping their bills. In addition to the type of price plan, consumers typically have a choice of contract term, ranging from 6 to 36 months depending on the supplier and the plan. A few plans have no fixed term, allowing switching at any time without penalty. Domestic users can also ask to have a smart meter installed, for example to provide accurate readings for TOU tariffs. While smart meters are optional for residential customers, they are compulsory for any small businesses wanting to switch to an alternative energy retailer. Already at this early stage, partnerships are starting to feature in the energy retailers’ strategies to grab consumer market share. Sunseap and Keppel Electric have hooked up with Singapore’s second and third mobile operators StarHub and M1, respectively, to co-market their electricity plans. Sunseap’s partnership with StarHub will see the companies in future introduce bundled home services including mobile, pay TV, broadband and electricity. Initially, StarHub is promoting Sunseap’s green tariffs via its sales and marketing channels. The collaboration also covers billing and customer service. Meanwhile, Keppel, whose telecom arm is a shareholder in M1, will sell its electricity plans in M1 stores, as well as eventually offer electricity bundled with mobile services. Keppel is already collaborating with M1 to use the carrier’s NB-IoT network for smart metering services. The arrival of the contestable domestic electricity market is also sparking interest from the banking sector. DBS has launched its DBS Electricity Marketplace to facilitate switching and payment set-up for its customers. Plans from Keppel and iSwitch are available during the soft launch and DBS says it will add other energy retailers to the platform in the future. Meanwhile, OCBC Bank has said that it is partnering with several electricity retailers and expects to introduce exclusive price plans for its banking customers. A key question is how many homes and small businesses will exercise their right to choose an alternative supplier. There are some eye-watering discounts on offer, as well as various new types of plan, such as those targeting the environmentally conscious or households whose consumption is skewed towards the off-peak. Japan saw 8% of retail power accounts switch to a new provider during the first 18 months of competition, but will Singaporeans be more or less engaged? Will consumers be tempted to sign up for the two-year contracts that offer the deepest discounts? Or will they instead favour shorter-term offers that allow them to try out a new supplier before getting too committed? 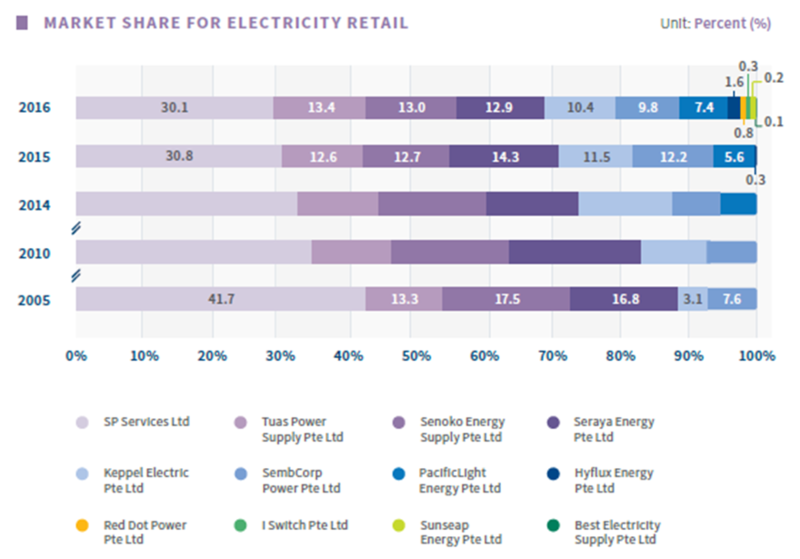 Which energy retailers will be the most successful in the short run in grabbing market share? With its banking and telco alliances, Keppel has secured two major routes to market, and there are big cross-marketing opportunities, too, for StarHub and Sunseap. How quickly can these partnerships bear fruit? Over the coming months, Quindi Research will be tracking developments in Singapore’s liberalising electricity market. For more information about our retail energy market intelligence services, please contact catherine.viola@quindiresearch.com.